Coun Mohammed Rafique, Leeds City Council’s executive member for environment and active life styles, welcomed the ‘Y’ trophies to the Reginald Centre Community Hub in Chapeltown – home to one of the council’s popular Bike Library schemes. The Tour de Yorkshire trophies also visited Wetherby One Stop Centre, Garforth One Stop Centre and Strawberry Fields Primary School. This year’s Tour de Yorkshire will include a men’s race between May 2 and May 5 and a women’s race from May 3 to 4. Leeds will host the conclusion of the men’s race on Sunday May 5. The Tour de Yorkshire will include all four corners of the county and will take in a 150 cities and towns. 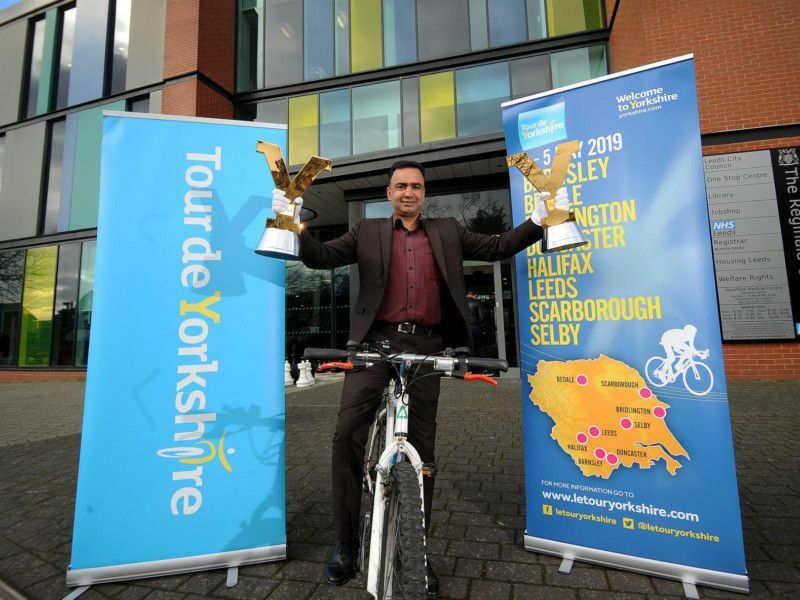 Coun Rafique, said: “The atmosphere in Leeds last year and the reception which was given to all of the riders in the Tour de Yorkshire was unbelievable, and we are very excited to be hosting the grand finale once again in 2019. “It was wonderful therefore to be able to welcome the trophy to Leeds and a number of our community hubs including the Reginald Centre, which offer a fantastic Bike Library scheme. “The Tour de Yorkshire and Leeds hosting the start of the Tour de France in 2014 has inspired so many people to cycle, and we have certainly seen this through our Bike Library scheme. Leeds City Council’s Bike Library schemes were introduced three-years ago. Thousands of people have taken advantage of the free initiative, which is now available at eight community hubs across Leeds. Working in partnership with Welcome to Yorkshire, all of the sites offer free bike loans to library members, children and adults for up to seven days. Community Hubs offering a free Bike Library scheme include Moor Allerton Community Hub, The Reginald Centre in Chapeltown, The Compton Centre in Harehills, St George’s Centre in Middleton, Armley Community Hub, Bramley Community Hub, Hawksworth Community Hub and Dewsbury Road Community Hub.